With the launch of the iPhone 7 and 7 Plus, Apple has further improved the already excellent cameras from its previous generation, and added a variety of new features it hopes will continue to make the iPhone the world’s most popular camera. While some of the new features are reserved for the 7 Plus, the iPhone 7 has received plenty of upgrades as well – including a brighter lens, improved image processing, four-element flash, and optical image stabilization. Both phones also use a new, wider color gamut, DCI-P3, making for richer colors when used with Apple or other high-end displays that support the DCI-P3 standard. Apple is also proud of its new algorithms running on a beefy new image processor, that melds together several images to create the best possible result. Based on our tests, we’ll show you how the new technologies measure up. Stay-tuned for our iPhone 7 Plus review: Coming very soon! The iPhone 7 Plus features additional capabilities based on its dual-camera architecture. It is not the first phone with a dual-camera, but it is the first to use the second camera for a 2x optical zoom, and computed depth information. 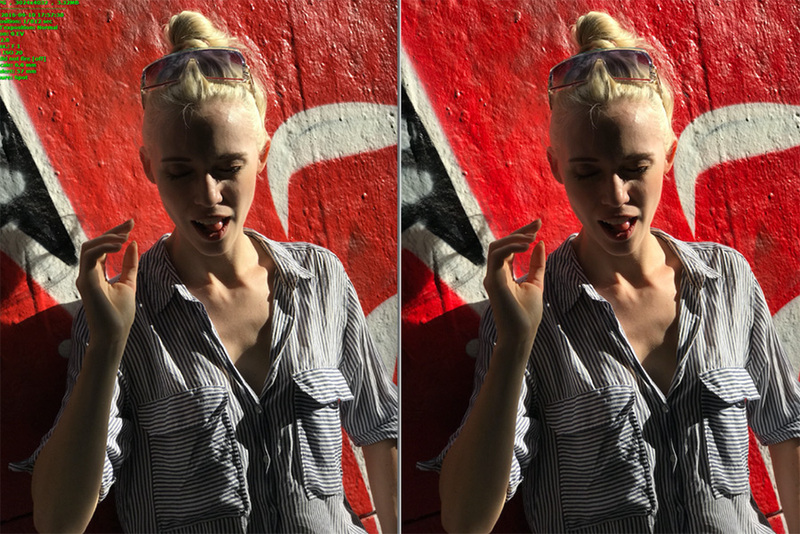 Its new Portrait mode is designed to use the depth information gleaned from analyzing the images from both of its cameras to selectively-blur image backgrounds, while keeping the foreground subject sharp. This is intended to mimic the shallow DOF effect and pleasing “bokeh” that photographers using DSLRs and other standalone cameras have been able to achieve. The new features and technologies in the iPhone 7 Plus require additional time for testing, so its review will follow this one, and be published shortly. The iPhone 7 camera represents a very solid evolution over the iPhone 6s and 6s Plus in both features and image quality. All three phones feature a 12MP 1/2.7”-type sensor, and a wide-angle (28mm equivalent) lens. 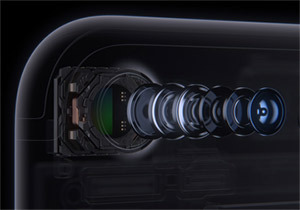 However, the iPhone 7 has a brighter lens – f/1.8 compared to the f/2.2 of the 6s and 6s. It also adds optical image stabilization, previously only found in Apple’s Plus models. Improved image processing and a more power efficient sensor rounds out its new feature set. 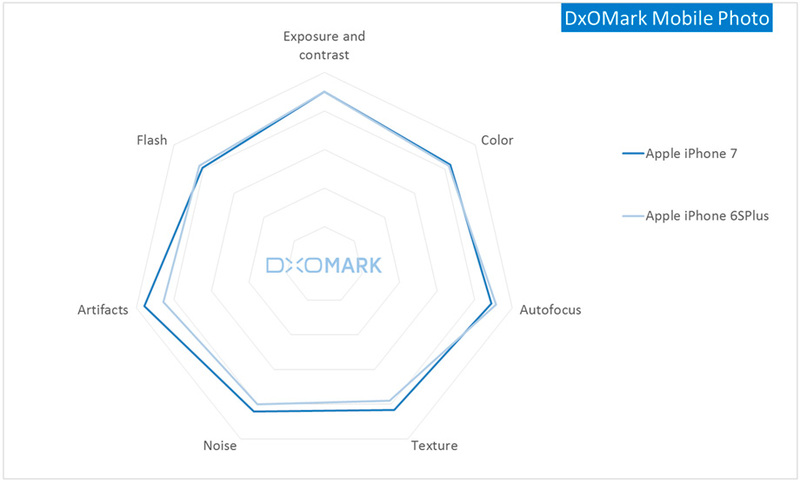 The iPhone 7 achieves an overall DxOMark Mobile Score of 86. That’s better than Apple’s previous best score of 84 for the iPhone 6s Plus and 82 for the iPhone 6s. 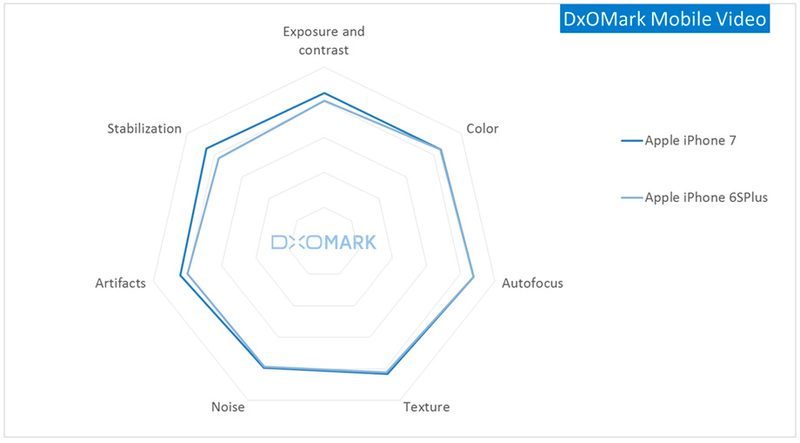 Its improved Texture performance is likely related to the new lens design, while its lower noise score shows the effect of its faster lens and improved image processing chip (ISP). Artifacts are also greatly reduced, thanks no doubt to the upgraded ISP. With very few weaknesses, the iPhone 7 secures a podium position with one of the top three scores among all the mobile phone cameras we have tested. Delivering superb photos and videos in a variety of shooting conditions, the iPhone 7 offers a visible improvement in image quality over the iPhone 6s Plus. The iPhone 7 offers great exposures with wide dynamic range, accurate white balance and color rendering, as well as good detail preservation when shooting outdoors in bright daylight. This has ensured a high Photo sub-score of 86 points, with the only weaknesses being a loss of very fine detail, some focusing irregularities in all lighting conditions, and visible luminance noise in low light. Remarkable stabilization in video mode, together with fast and smooth autofocus, nice details and vivid color in bright light, produced a high Video sub-score of 85 points. 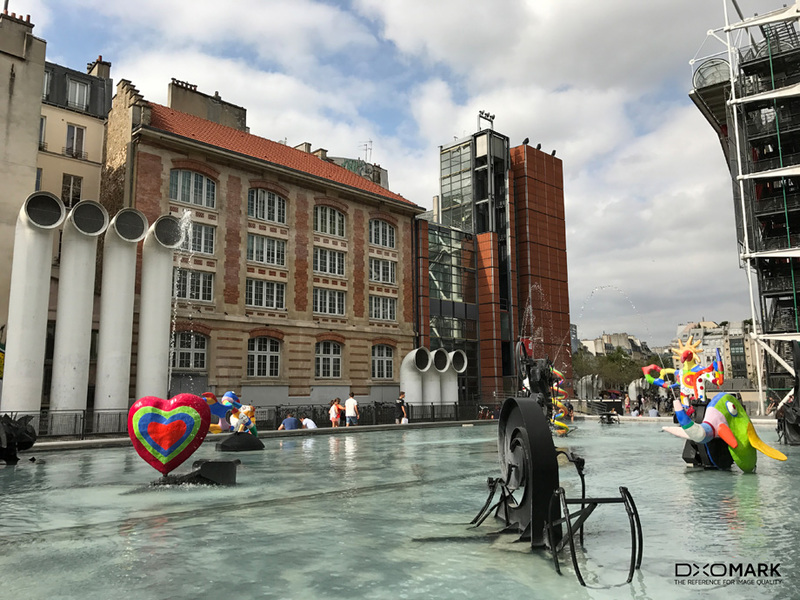 The iPhone 7’s camera records great exposures with wide dynamic range, excellent color rendering, and good detail, delivering a visible improvement over the iPhone 6 Plus. There were some exposure failures, such as overexposed highlights, in very tricky or high-contrast scenes, but the instances of these were minimal. In general, HDR-mode exposures displayed excellent detail across the entire tonal range, with well-defined skies and clouds in the highlights, and visible details in the shadows. Photo Tip: When capturing images – especially outdoors – where there is a large variation in the brightness of the scene and minimal motion, remember to use the camera’s HDR mode which automatically combines several exposures to create a single image that represents the full tonal range from dark to light. Successful HDR exposures render a full range of tones with good shadow details that display no visible color shading, and little visible noise in areas with high levels of detail. The iPhone 7’s camera achieves good detail preservation when shooting outdoors, with only the very finest details lost and just a fine luminance noise visible in uniform areas. 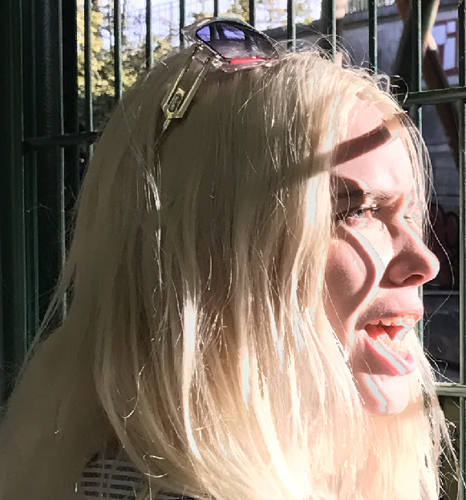 Although the HDR usually gives good results, artifacts can appear in very challenging scenes (for example, the grey lines between the shadows and the bright parts of the face and lips). One result of the iPhone’s improved 6-element lens design, and perhaps its improved image processor, is excellent corner-to-corner sharpness. This isn’t always easy to see in natural images, but comes across clearly in our lab tests. 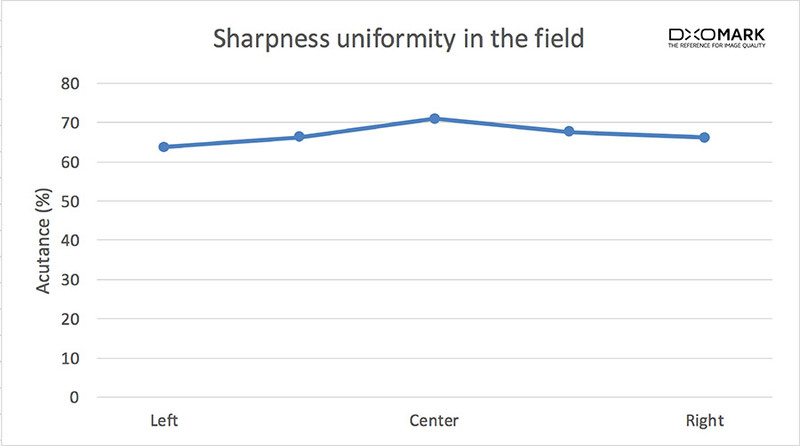 You can see it here by the smooth 3D chart of sharpness (Acutance) and how similar the ratings are across the visual field in the accompanying table. both in our objective measurements and in natural images. In this test image, you can see how details are preserved throughout the frame. While the iPhone 7 has good detail preservation in outdoor conditions, slight luminance noise is noticeable. Accurate color representation is only possible when the camera correctly estimates the color of light falling on the scene – typically called the White Balance. Part of the job of the camera’s image processing chip is to analyze the scene as it is captured and select a White Balance, ranging from warm to cool, that recreates the scene the way the human eye sees it. The new ISP in the iPhone delivers on this test, with images typically showing excellent White Balance. Good white balance. In some cases, a barely noticeable green cast can appear. With its fast-aperture f/1.8 optical image stabilized lens, the iPhone 7 delivers good photos in low light. Images shot under extreme low-light conditions (5 Lux) record bright images with good exposure. At 5 Lux, images display visible luminance noise that causes a loss of detail (typical for a smartphone in these conditions). Exposures at 10 and 20 Lux continue to be bright, with reduced levels of noise and good detail preservation, thanks to the use of lower ISO sensitivities; and at 100 and 500 Lux, handheld images are significantly sharper due to the faster shutter speeds made possible by the combination of the fast lens and OIS. Overall, indoor images display a pleasant color rendering. In some specific cases such as images shot under tungsten light sources a slight yellow colorcast was observed. Indoor images shot under an extreme low-light source (5 Lux) are very usable, with bright exposure and nice color; and although luminance noise is visible, some details are preserved. Photo Tip: Optical Image Stabilization (OIS) on the iPhone 7 makes it possible to get sharp images under lower light than with previous models. Keep in mind, though, that while OIS helps hold your camera steady, it can’t cure motion in your subject. So it is at its best when photographing still or slow moving scenes. That being said, the new, faster, f/1.8 lens, does help create lower light images even of fast moving subjects – by letting in about 50% more light than the previous f/2.2 design. Some minor exposure failures do happen, such as the over-exposed pillar (left) and lamps (right), but they’re acceptable, and in general the iPhone 7 exposes images quite well. In low-light, images showed some motion blur, but that is fairly typical of even high-end smartphones. 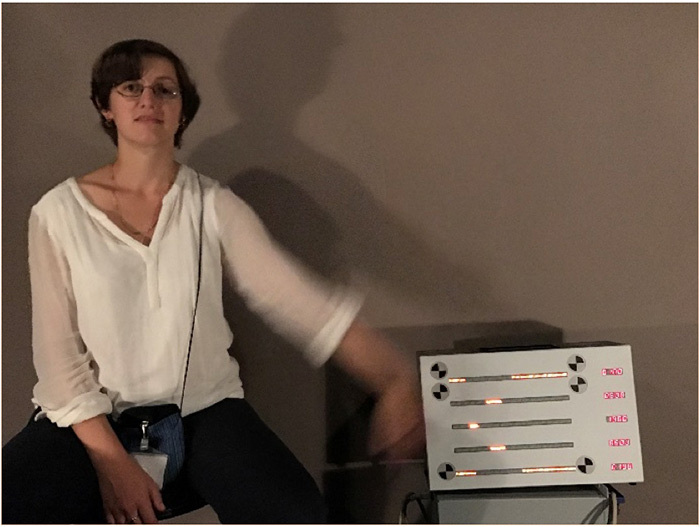 Our low-light (5 Lux of tungsten illumination) tests showed motion blur, visible in the waving arm. 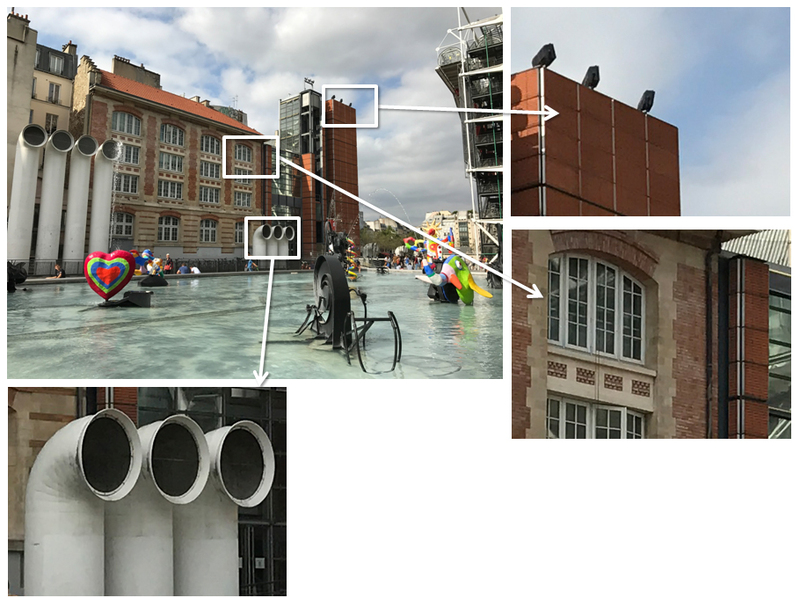 The iPhone 7’s Autofocus using Phase Detection pixels (PDAF) is very fast in bright light and is pretty stable, offering repeatable performance in most situations, although we did observe some irregularities and failures even in bright light. Technical Note: Phase-detect Autofocus (PDAF) pixels are one of the most important innovations in Autofocus technology. 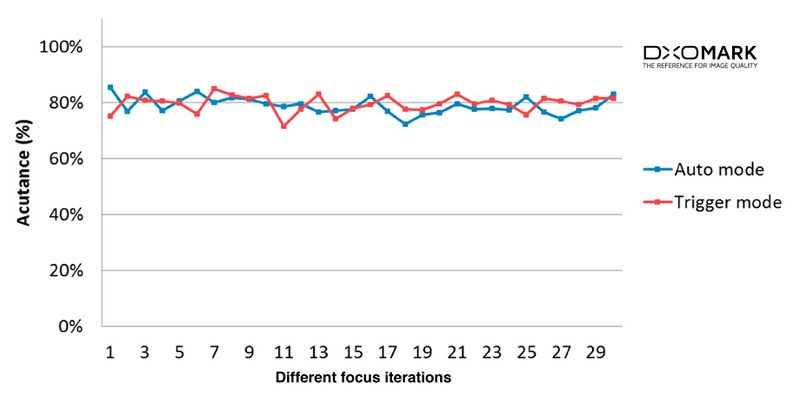 Traditionally, only DSLRs had the ability to do super-fast phase-detect Autofocus. 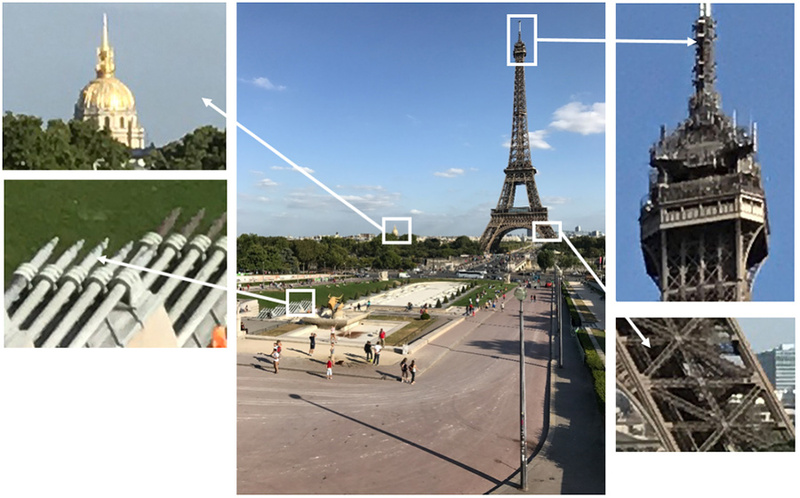 Lesser cameras, including smartphones, had to rely on contrast detection – essentially analyzing image previews to try to guess whether they are in focus. Recently, technology has allowed placing phase detect pixels among the other pixels on a standard CMOS sensor. The resulting improvements in auto-focus speed and accuracy have been significant for some mirrorless and compact cameras, and high-end smartphones like the iPhone 7 that have adopted this technology. Perfect autofocus means delivering sharpest possible image. Our lab tests use 30 successive pictures in auto mode and in touch-to-focus mode (trigger mode). In this chart you can see that the iPhone 7 provides fairly consistent results throughout the trials. Apple was one of the first to innovate with multiple, different-color, flash LEDs that let them balance the light from the flash with the ambient light, for optimal color reproduction. It has upgraded the dual-tone flash in the iPhone 7 family from two to four LEDs for brighter flash output. The resulting flash system achieves very good color rendering, especially for skin tones, although it does suffer from strong non-uniformity because of luminance fall-off (corner shading) and slight irregularities in the Autofocus. Here is a more direct illustration of flash fall-off. Note how well lit the target and subject is, and how dark the corners are. If you’re looking for a good all-round multimedia smartphone, the iPhone 7 is an excellent choice, with top-quality video recording that rivals its still photography performance. Video exposures are very good overall, and particularly so in outdoor or bright light conditions, where movies display nice dynamic range with vivid and bold colors.In low light, video dynamic range is a little more limited and some slight steps in exposure adaption are noticeable as the lighting changes, but overall the results remain very good. Video Autofocus is fast and accurate in bright light, and just a little slower in low light. Stabilization is excellent in bright light, allowing you to capture smooth and stable videos most of the time. In low light, some minor frame shifts and motion blur are noticeable with walking movement. Overall, artifacts are well-controlled without significant aliasing. Color rendering is also very good, without visible color shading on videos. White balance is accurate, particularly outdoors, with pleasant color. We did find that some videos in bright light displayed colors that were a little over-saturated, and white balance on videos shot under tungsten light sources had a slight pink colorcast, but it wasn’t of much concern. Texture preservation on outdoor videos is very good too, capturing well-defined details. But in low light, the visible luminance noise results in weaker performance than that of other top video smartphone cameras. Specifically, Apple is now using the Digital Cinema color space (officially DCI-P3) for JPEG images captured with the iPhone 7 — rather than the traditional sRGB color space, commonly used for JPEGs and for consumer devices. Apple calls this color space Wide Color, because it allows the storage and display of richer colors than sRGB, particularly reds and greens. DCI-P3 has also been adopted for premium TVs that support the Ultra HD standard, so it fits well with sharing images and videos destined for later viewing on high-end devices. Many smartphone cameras are capable of capturing richer colors than can be displayed using sRGB. However, since they store their JPEG images in sRGB, the only way to access those additional colors has been to shoot in RAW. So Apple’s innovation here is to allow JPEG shooters to record richer colors than typical of a smartphone camera, and to provide a high-quality display that reproduces them faithfully. 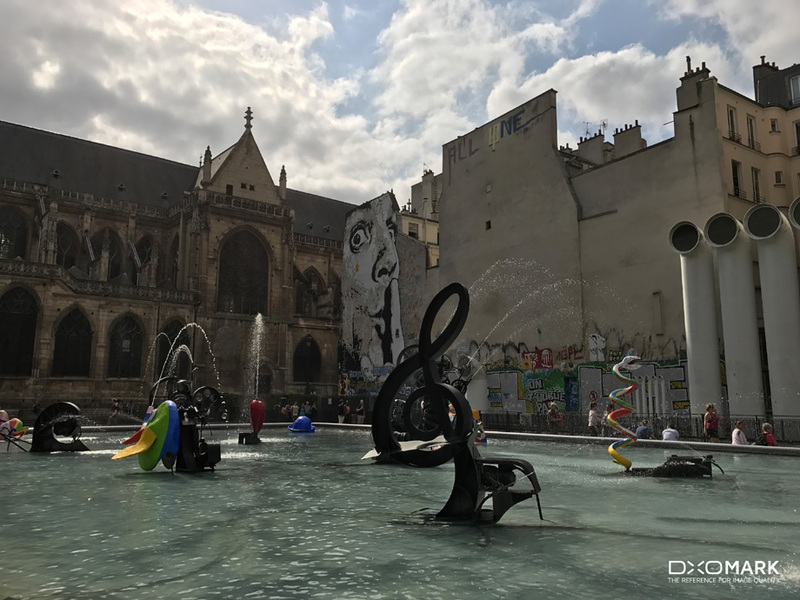 Photo Tip: Getting richer color using the iPhone 7’s wide color gamut: One of the interesting innovations in the iPhone 7 is its use of a wider-gamut color space, allowing it to store and display deeper-and-richer colors in its JPEG photos. To take full advantage of this new capability you’ll want to view your images on a color-rich display like that of the iPhone 7 and other Apple devices that support the new DCI-P3 color gamut used by the iPhone 7 and iPhone 7 Plus, or on a premium, color-managed monitor or an Ultra HD TV. 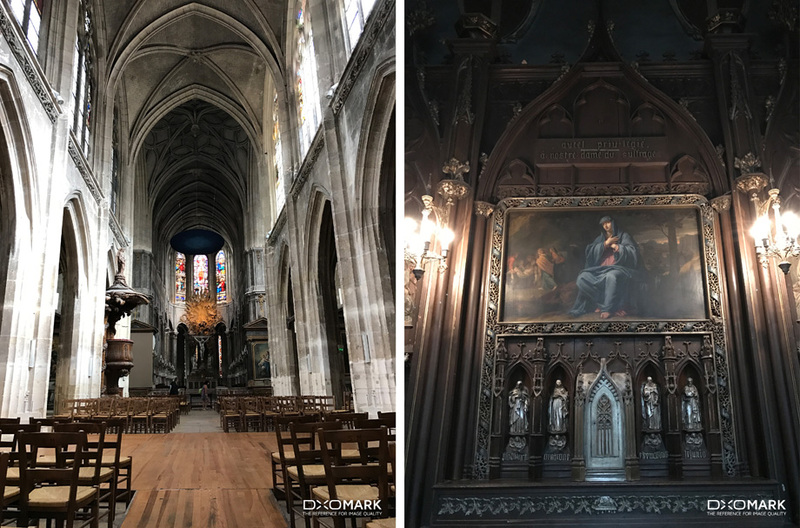 Conversely, iPhone 7 photos may look slightly washed-out when viewed on devices that do not support the appropriate color management (DCI-P3), as they would wrongly interpret iPhone7 JPEGs as being encoded in sRGB. 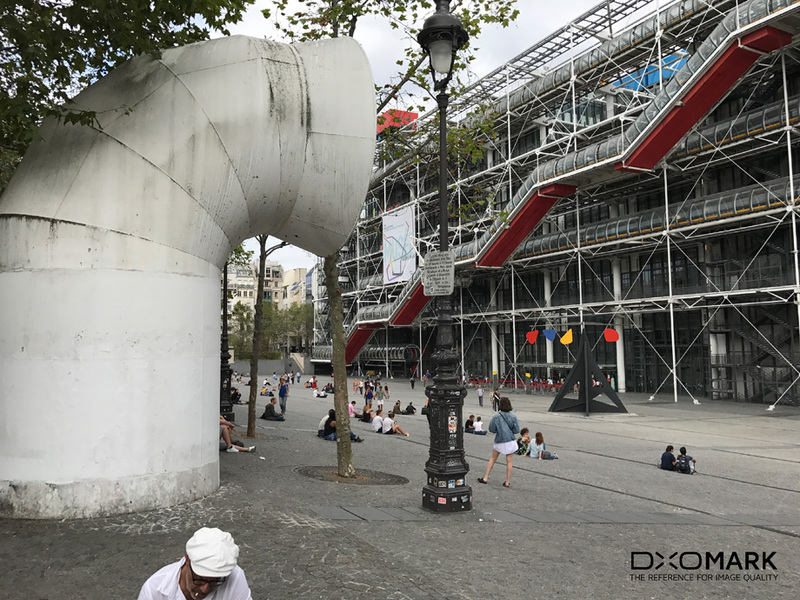 A JPEG image shot with iPhone7 using DCI-P3 color space. Left: Rendered using the traditional sRGB color space. Right: Rendered as shot Notice the richer reds displayed when using the wider-gamut profile. 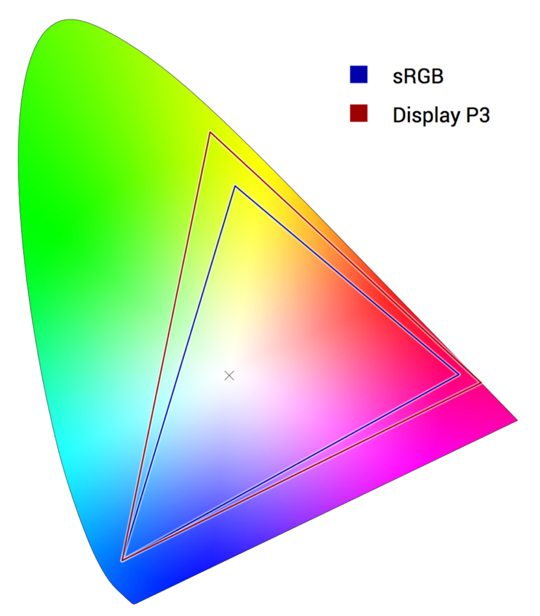 For many years, consumer cameras and monitors have settled for an easy-to-reproduce standard for color reproduction, called sRGB. High-end devices, however — including DSLRs, Digital Cinema projectors, high-end monitors, and now even smartphones — are now able to record and display a much-wider range of colors. 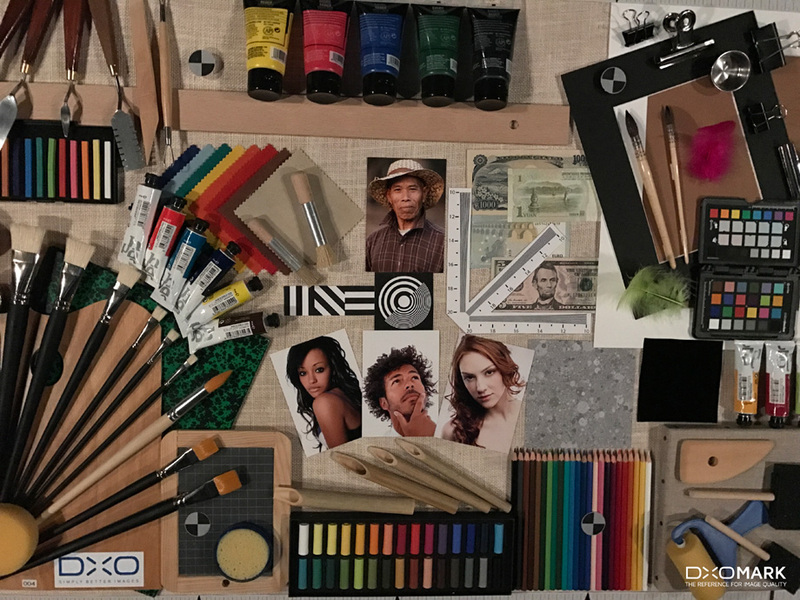 Professional photographers and movie makers have long built color-managed workflows to create output superior to sRGB, but most consumers have had to settle for less, since their cameras and phones have been restricted to recording images using only the sRGB color gamut. Now, Apple is changing that. By supporting the Digital Cinema (DCI-P3) color gamut, it is providing its smartphone users with the potential for the same high-quality color reproduction that is available in high-end movie theaters and on Premium Ultra HD TVs. 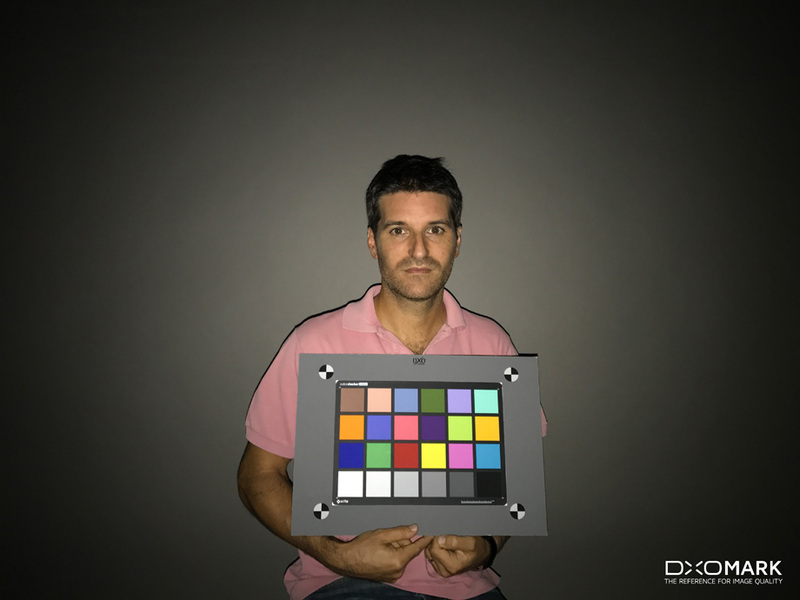 It may be a little hard to imagine how to evaluate the visual impact of richer colors, but essentially Digital Cinema color does for color rendering what HDR does for tone mapping. It provides a broader, richer, palette of colors that can be rendered, resulting in a more immersive and compelling viewing experience…as long as the display device is capable of handling the additional colors. The only disadvantage to using DCI-P3 is that images captured using it may look a little dull when viewed on a non-color-managed display. Smartphone image quality relies on camera performance, which is in turn driven by sensor size and how the optical elements are stacked. Simplistically, a larger stack of lens elements will produce a more accurate image, Similarly, the specific choice of optical elements also defines the field of view and aperture of the lens, as well as sharpness in the corners of an image. Wider apertures, which are most useful in low light, and better edge-to-edge sharpness require taller stacks of image elements, and therefore a thicker lens assembly. The result is either an overall thicker phone, or a thin phone with a large “camera bump”. Most smartphone vendors want to create the thinnest possible device for their customers. Since the camera is almost always the thickest part of a phone, this creates a conundrum between having optimal image quality or making the thinnest possible phone. The result is a series of compromises that manufacturers have addressed in a variety of ways. 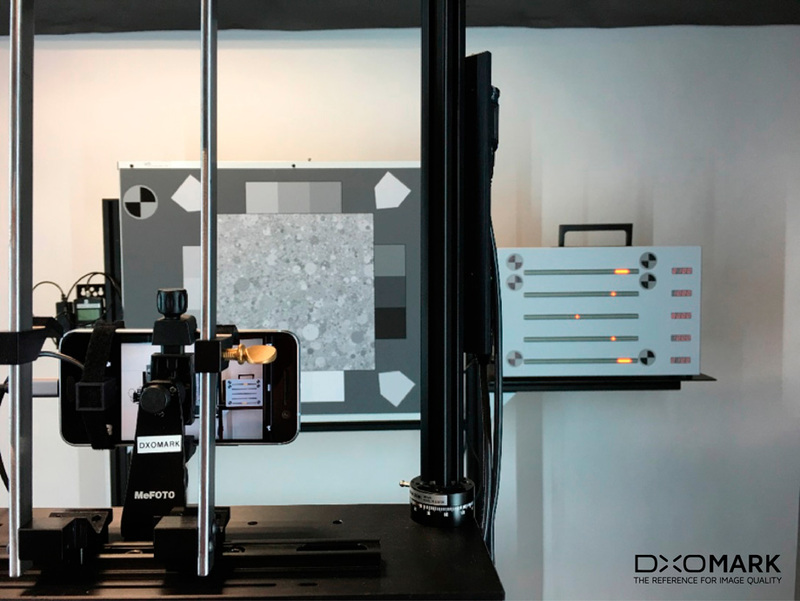 Each manufacturer has a different smartphone thickness target, and a different tolerance for the "camera bump" to accommodate additional imaging elements or a larger sensor. Smartphone sensors are small compared to DSLRs and 1-inch sensor cameras, but some are larger than others. Beyond these simple considerations of first-order optics, the reality of camera design is much more complex. 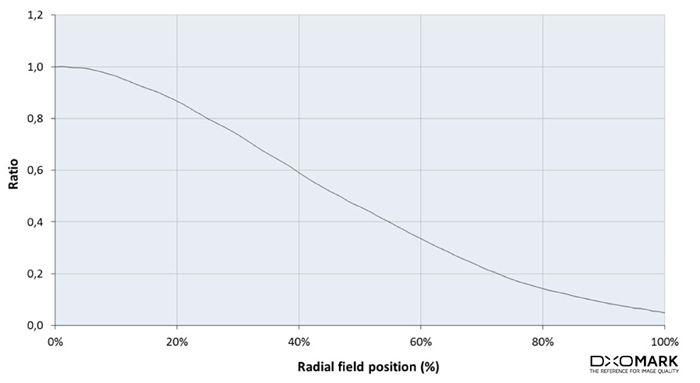 The success of the lens design depends as much on such constraints as the ability to keep the same sharpness in the corner of the image or tightly control the back-focal length as it does on materials science to provide optical engineers with thinner and thinner optical-quality plastics. Further, sensors have become more and more sensitive while maintaining the same size; and last but not least, ISPs and their multi-image algorithms and tuning play a significant role in the camera’s output performance. For the first time, with the introduction of the iPhone 7 and 7 Plus, Apple has made its RAW captured images available to developers of third-party photo applications. This is very exciting news to serious photographers hoping to coax the ultimate image quality out of their iPhones. Photo Tip: Why RAW Matters: Sometimes it isn’t easy to get every camera setting perfect before you capture an image. That’s one reason many serious photographers shoot in the RAW image format, which allows them to customize the way their images are post-processed (i.e., after they are shot). Until recently, iPhone users were unable to harness the benefits of RAW. Some Android phones have added RAW support, and now with the iPhone 7 family, Apple has as well, which means you can capture now, and process later. Apple’s own iOS Camera app doesn’t provide acess to their own RAW files, but Adobe Lightroom and some other applications do, for 12MP iPhones, as well as for some Android phones. 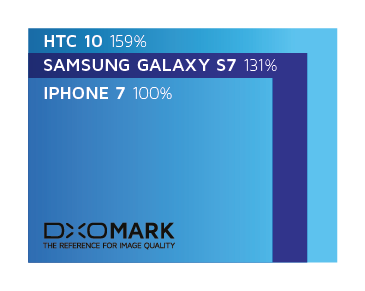 Note, this ability to access the RAW files doesn’t directly affect a smartphone’s DxOMark scores, since those scores are based on images as they come out of the phone, but it does provide more flexibility for photographers serious enough to be willing to invest in software capable of post-processing their RAW images. The traditional definition and purpose of a RAW image has been challenged by the multi-frame algorithm described by Apple as part of the iPhone 7 announcement. 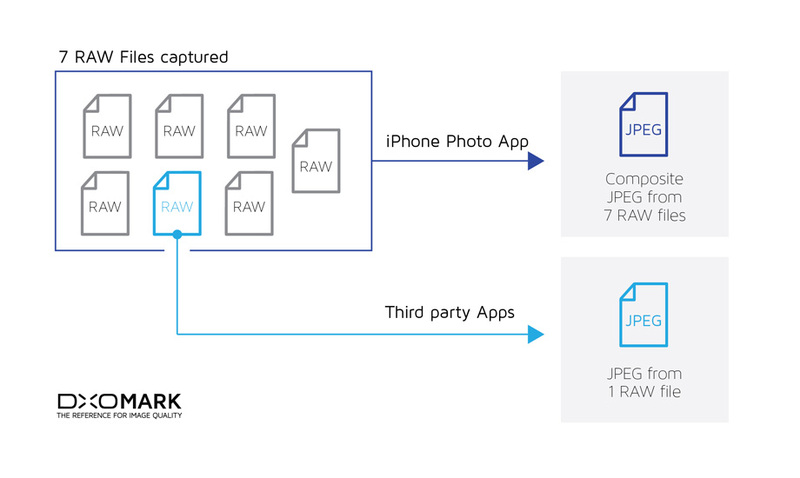 Because it starts from a set of 3 to 7 RAW images (Apple did not disclose the exact number), the native Apple camera application already has a giant lead on third-party RAW processing applications for the iPhone. 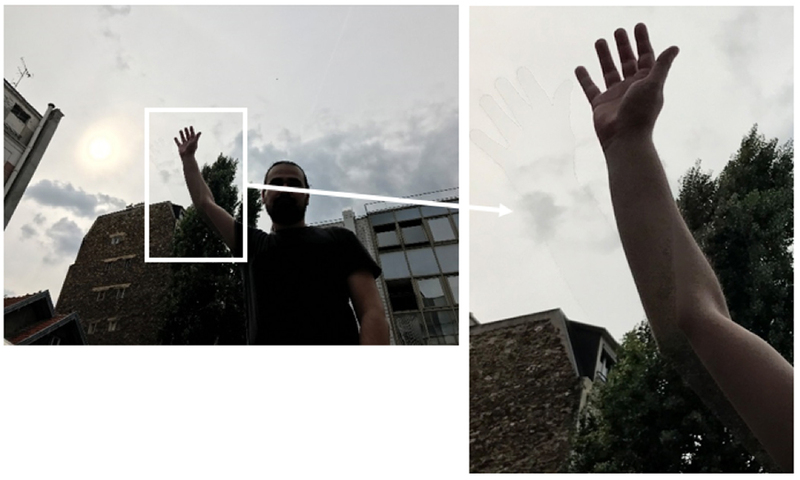 When the user presses the shutter to capture an image, the smartphone’s processing chipset selects the best reference frame using a variety of criteria, including face detection and focus quality. It then merges that image with neighboring frames to improve the dynamic range and reduce noise. The best smartphone manufacturers have commonly used such multi-image algorithms for few years now, but Apple seems to be taking it to a whole new level. Apple uses multiple RAW images to automatically assemble an optimal JPEG. Other app developers, such as Adobe, need to do their best with one image at a time. There is an obvious problem with assembling a composite image from several individual frames. Objects that are moving quickly while the images are captured can appear “ghosted” if the camera’s software does not correct the problem. The iPhone 7 demonstrated exactly that shortcoming in our testing, both in harshly-backlit outdoor scenes and very-low-light indoor scenes. The effect isn’t dramatic, but can be disconcerting. Whether some applications can provide better-quality JPEGs from a single RAW file by using more computational power and different algorithms compared to the Apple application’s use of multiple RAW files is a very interesting question — one that can only be answered as photographers use those applications. Beyond consumer photography, making RAW files available to developers has the possibility to open new fields for professional applications such as medical imagery, where it is more important to have the certainty of a single RAW image rather than the risk of artifacts such as ghosting or false colors being introduced via multi-frame processing. Apple’s iPhone 7 improves on the image quality of its previous devices, with advances in dynamic range, detail preservation, and significantly reduced artifacts, as well as very good stabilization. It performs particularly well in bright light conditions, making it a great smartphone camera for outdoor enthusiasts shooting landscapes, street scenes, architecture, or portraits. A more efficient sensor should also mean that the new phone’s camera is more battery friendly, and a more powerful image processing chip can produce image quality improvements beyond those provided by the new sensor and re-designed lens. Very good overall target exposure and wide dynamic range. Stable and generally good white balance. Good detail preservation in outdoor conditions. Fast autofocus in bright light conditions. Flash: accurate white balance, good color rendering, and low levels of noise. Fast and smooth autofocus in bright light conditions. Nice detail in bright light conditions. Very fine details are lost in outdoor and low-light conditions. Luminance noise is visible in low light. Some autofocus irregularities are noticeable in all conditions. Flash: the autofocus is unstable over consecutive shots and strong luminance shading is visible. Strong luminance noise in low-light conditions. Exposure and white balance adaptation are sometimes unstable. Slight frame shifts are noticeable indoors and with walking movement. Autofocus is slower in low light.